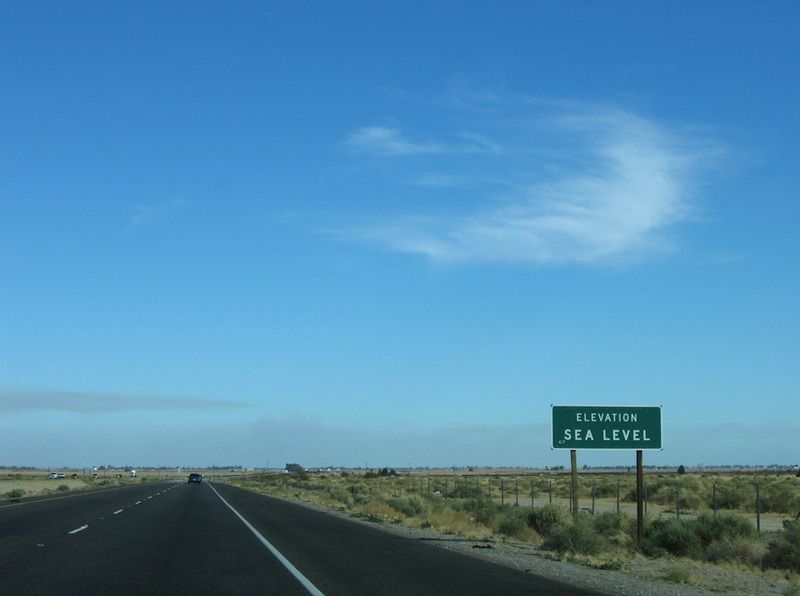 Many miles from the ocean, Interstate 8 lowers to Sea Level in the Imperial Valley of California. Photo taken 01/27/06. 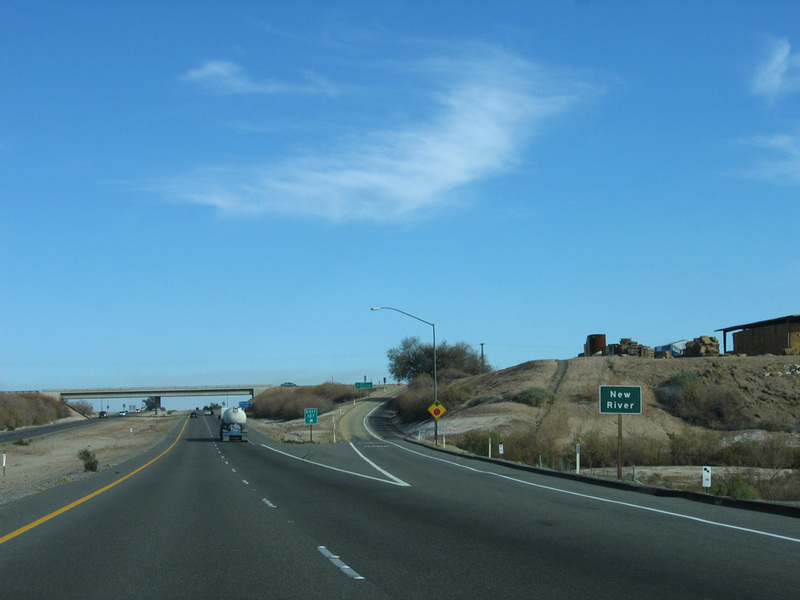 The lowest Interstate in the country at one point (as the freeway drops below sea level elevation in the Imperial Valley near El Centro), Interstate 8 also traverses several mountain passes on its journey between San Diego, California, and Casa Grande, Arizona. I-8 provides a dynamic look at everything that’s good about an Interstate: It has the multi-lane, urban feel in San Diego, the mountainous terrain with peaks and valleys in Cleveland National Forest/Laguna Mountains, the In-ko-pah Gorge, rolling desert hills, farmland in the Imperial Valley, the vast Imperial dunes, a Colorado River Bridge and more desert scenery (including the famed Arizona saguaro). Interstate 8 only intersects one U.S. route for its entire length, U.S. 95, thus lending credibility to the paucity of U.S. highways in the Southwestern United States. However, it parallels a well-preserved historic U.S. route, Old U.S. 80. U.S. 80 follows Interstate 8 from San Diego to Gila Bend, Arizona, where U.S. 80 turned north along what is now Arizona 85 to Interstate 10 near Buckeye. Well-preserved stretches of Highway 80 are otherwise accessible as frontage roads and county roads along the freeway corridor. 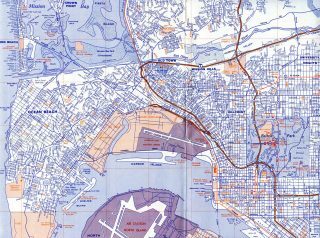 Origins of Interstate 8 in San Diego date back to 1957 with construction for a new U.S. 80 freeway between U.S. 395 and Ward Road. The majority of the U.S. 80 freeway was completed east from U.S. 101 to El Cajon by the early 1960s, with I-8 formally posted in 1964. The Pine Valley Creek Bridge opened to traffic in 1975. This segmental balanced cantilever bridge carries the freeway over 200 feet above the valley floor.1 A more detailed history for I-8 posted at the Interstate 8 California guide. 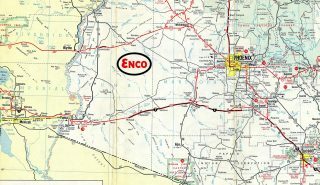 Within Arizona, the earliest sections of Interstate 8 completed ran between Sentinel (Exit 87) and Piedra (Exit 102) and from Gila Bend (Exit 119) to Arizona 84 (Exit 151) in 1959. The Colorado River bridge west of Yuma opened in 1979 as the last portion of I-8 opened overall. See the Interstate 8 Arizona guide for a more detailed time line. The lowest point on the entire Interstate Highway System (excluding underwater tunnels) is located on Interstate 8 at this point, when the freeway crosses the New River at an elevation of 52 feet below sea level. The lowest point is located near Exit 107 (Drew Road), which is west of El Centro in California’s Imperial Valley. Further west, I-8 climbs to over 4,000 feet above sea level to cross the Cuyamaca Mountains. Photo taken 01/27/06. 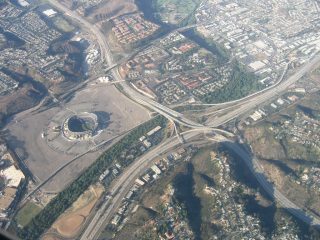 Interstates 8 and 15 meet at a multi-level stack interchange adjacent to Qualcomm Stadium (former home of the San Diego Chargers) in Mission Valley, San Diego. Photo taken 09/02/06. 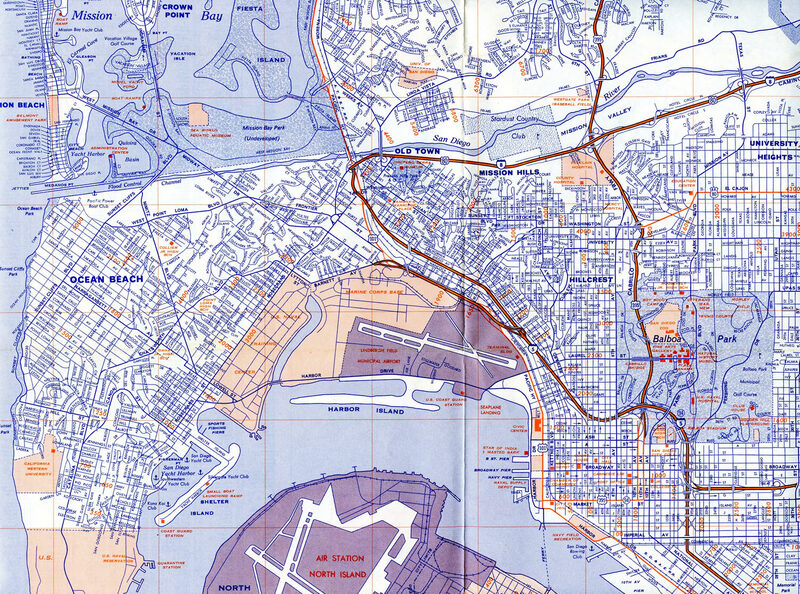 Interstate 8 ended at Interstate 5 until 1971, when the Ocean Beach Freeway was renumbered from California 109 to I-8. U.S. 80 was decommissioned formally by the state of California in 1964, but signs remained along I-8 until 1972. Long pieces of Interstate 8 were open by 1963 along U.S. 80 through San Cristobal Valley and across Sentinel Plain and over AZ 84 between the Sand tank and Maricopa Mountains and across Vekol Valley. Within Arizona, U.S. 80 was truncated from Yuma east to Benson in 1977. The remainder was dropped in 1989. This is the last Interstate 8 east reassurance shield. The on-ramp from the right merges onto the freeway from Exit 174 / Trekell Road. Photo taken 05/24/03. Two-mile guide sign for Exit 178A/B with Interstate 10. The least traveled stretch of I-10 between the Phoenix and Tucson metropolitan areas is between Interstate 8 (Exit 199) and Arizona 84 (Exit 198). AZDOT recorded 36,039 vpd there in 2015, up from 25,479 vpd in 2002. Photo taken 05/24/03. Traffic on Interstate 8 east defaults onto Interstate 10 east to Tucson in one mile. A left-hand exit provides return access to Casa Grande and the Greater Phoenix Metropolitan Area. Photo taken 05/24/03. Interstate 10 ventures southeast 57 miles to Tucson from I-8. The Arizona capitol of Phoenix is 47 miles to the northwest. Photo taken 05/24/03. Interstate 8 ends at a trumpet interchange (Exit 178) with Interstate 10 in a rural area just east of the Casa Grande Mountains. Photo taken 05/24/03. A pair of I-10 trailblazers accompany the gore point at the eastern terminus of Interstate 8. The junction is located within the southeastern Casa Grande city limits. Photo taken by Alan Hamilton (08/02). Non reflective button copy overheads at the separation of Exits 178A/B. On the horizon are the Picacho Mountains. Photo taken by Alan Hamilton (08/02). A reassurance marker for Interstate 8 stands along the westbound ramp from I-10, following a slip ramp from adjacent Sunland Gin Road. Photo taken 01/17/05. Interstate 8 travels 60 miles west from I-10 to Gila Bend and 176 miles to Yuma. Downtown San Diego lies a short distance further than the total miles of I-8 (348). Photo taken 01/17/05. Interstate 8 travels west through southwestern Arizona en route to California’s Imperial Valley and San Diego on the coast. Interstate 10 continues northwest to Phoenix, Chuckwalla Valley, Coachella Valley, and ultimately the Los Angeles Basin. Photo taken 01/17/05. Westbound Interstate 10 westbound approaches Exit 200 / Sunland Gin Road and Exit 199 / Interstate 8 west. Interstate 8 and Arizona 85 form the preferred bypass route for traffic bound for I-10 west to Los Angeles, California. These signs were placed sometime between 2003 and 2005. Photo taken 01/17/05. The Sunland Gin Road exit includes several fuel options. Interstate 8 splits from I-10 west nearby and travels 60 miles with limited travel services to Gila Bend. Photo taken 01/17/05. Exit 199 leaves Interstate 10 west for I-8 to Yuma, El Centro and San Diego, California. 9,148 vehicles per day were recorded on the initial stretch of Interstate 8 by AZDOT in 2015. Photo taken 01/17/05. The on-ramp from Sunland Gin Road west to Interstate 10 includes access to Exit 199 for I-8 west. The ramp otherwise bypasses the trumpet interchange to join I-10 ahead of Jimmie Kerr Boulevard. This configuration was added to offset weaving traffic for trucks entering from adjacent Sunland Gin Road. Photo taken by Marc Welby (10/00). Button copy signs formerly posted for Interstate 8 west (Exit 199) and decommissioned Arizona 84 (Jimmie Kerr Boulevard). Arizona 84 was truncated to Casa Grande. It leads west from there to Interstate 8 at Exit 151. Photos taken 01/01/03. The first guide sign for Exit 199 / Interstate 8 west on Interstate 10 east. Ahead is the folded diamond interchange (Exit 199) with Jimmie Kerr Boulevard (old Arizona 84) in south Casa Grande Photo taken 01/17/05. One mile north of the trumpet interchange (Exit 199) with Interstate 8 west to Gila Bend on I-10 east. Photo taken 01/17/05. Exit 199 parts ways with I-10 east just south of Jimmie Kerr Boulevard (old AZ 84). Interstate 8 west circumvents the Case Grande Mountains west. Photo taken 01/17/05. Interstate 8 ventures west 341 miles from I-10 to meet Interstate 15 in Mission Valley, San Diego. Photo taken 01/17/05. Guide signs for Interstate 8 east used to include Yuma as a second control city. Note also that exits for both I-8 and Arizona 84 were unnumbered. Photo taken by Michael Summa (1988). Originally, Interstate 8 was planned to end at Interstate 5. However, with the construction of the Ocean Beach Freeway (former California 109), the route was extended west to a new terminus at the intersection of Nimitz Drive and Sunset Cliffs Boulevard. I-8 westbound narrows to two through lanes here for the first time since entering the city of San Diego. The overhead for I-5 north was replaced by 2016 and now displays Exit 2A. Photo taken 10/08/05. Beyond Interstate 5, Interstate 8 (Ocean Beach Freeway) expands to four westbound lanes to a parclo interchange (Exit 1) with West Mission Bay Drive north and Sports Arena Boulevard south. Photo taken 10/08/05. Two lanes depart from I-8 west for Mission Bay Drive north across the San Diego River to route to Mission Beach and Pacific Beach and Sports Arena Drive south to the Midway-Sports Arena District, including the Valley View Casino Center (San Diego Sports Arena). Photo taken 10/08/05. Advancing west along side the San Diego River, Interstate 8 ends in one half mile at a signalized intersection with Sunset Cliffs Boulevard south and Sea World Drive north. Photo taken 10/08/05. Westbound Interstate 8 ends just north of the Sunset Cliffs Boulevard split with Nimitz Boulevard. Sunset Cliffs Boulevard forks to the west into Ocean Beach from the right-hand lanes beyond the signal with I-8. Photo taken 10/08/05. End freeway sign bridge posted one quarter mile ahead of the signal with Sunset Cliffs Boulevard. Photo taken 10/08/05. Sea World Drive spans the San Diego River north to an interchange with West Mission Bay Drive by Sea World. Nimitz Boulevard angles south to Point Loma Heights and North Harbor Drive. Photo taken 10/08/05. A rarity in Southern California, Interstate 8 is signed with an end shield. Photo taken 10/08/05. Two lanes turn south from Interstate 8 to Sunset Cliffs Boulevard ahead of the split with Nimitz Boulevard. Plans once called for the possible construction of an interchange here, which would extend Interstate 8 another tenth of a mile westward. The area behind the traffic light is Robb Field Skate Park, so any extension of Interstate 8 would likely take a southwesterly trajectory. Photos taken 10/08/05. Leaving Ocean Beach, northbound Sunset Cliffs approaches the intersection with Nimitz Boulevard and Interstate 8 east. Signs along Sunset Cliffs Boulevard were placed by the city of San Diego, not Caltrans. Photo taken 08/11/06. Since there is no access from eastbound Interstate 8 to northbound I-5 north, signs recommend using Sunset Cliffs Boulevard east to Sea World Drive to Interstate 5. I-8 otherwise sees a direct ramp to I-5 south. Photo taken 08/11/06. Sunset Cliffs Boulevard crosses the San Diego River to enter the Mission Bay Interchange with Sea World Drive, Ingraham Street and West Mission Bay Drive. During hot summer afternoons, Sea World Drive can be extremely congested with beach traffic trying to make its way back to Interstate 5. Photo taken 08/11/06. Traffic from Sunset Cliffs Boulevard merges with motorists from Nimitz Boulevard north as Interstate 8 (Kumeyaay Highway) begins. The I-5 and I-8 shields here were retrofitted onto an older Caltrans sign by the city of San Diego. Photo taken 08/11/06. Westbound Sea World Drive enters the Mission Bay Park interchange, where traffic for Interstate 8 east to I-5 south loops onto Sports Arena Boulevard south. Sea World Drive continues west onto Sunset Cliffs Boulevard to Ocean Beach. Photo taken 08/11/06. Westbound Sea World Drive reaches the connecting ramp onto southbound Sports Arena Drive. 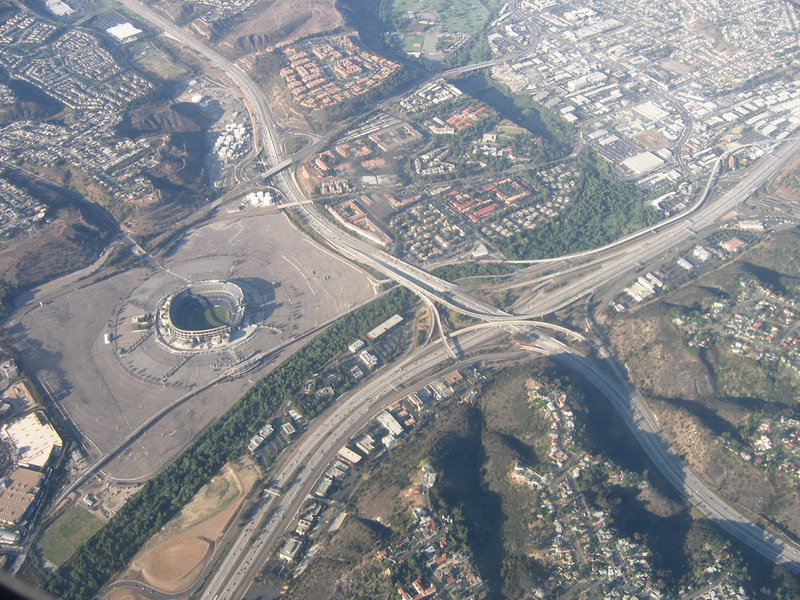 Sports Arena Drive crosses the San Diego River ahead of a loop ramp for I-8 east and the Midway-Gateway area of Point Loma. Photo taken 08/11/06. The first sign after the freeway entrance shield assembly marks Interstate 8 as the Kumeyaay Highway. Photo taken 08/11/06. Ramps from Sports Arena Boulevard add two additional lanes to Interstate 8 (Ocean Beach Freeway) to the systems interchange with Interstate 5 south (Exit 2). Picture here is the first of many pull-through signs on eastbound Interstate 8 with the control city of El Centro (in the Imperial Valley). Photo taken 08/11/06. Interstate 5 (San Diego Freeway) heads south from Exit 2 to Downtown San Diego and Chula Vista. Interstate 8 advances east to Mission Valley, San Diego State University and the cities of La Mesa and El Cajon. Most of the route is four to five lanes in each direction, excepting this two-lane section for eastbound through the exchange with i-5. Photo taken 08/11/06.